A motorcycle streaks past diners at a street food stall on Sukhumvit Soi 38. 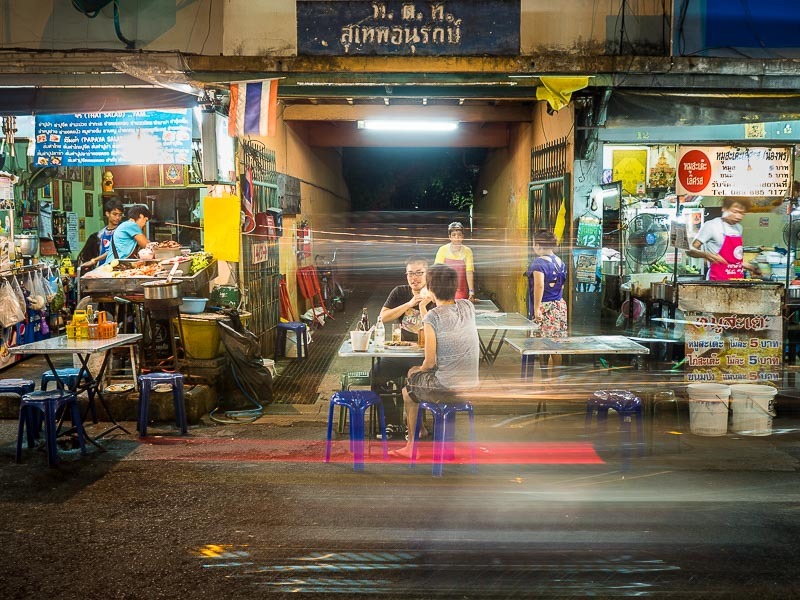 One of the great things about Bangkok is the extraordinary street food. It's almost everywhere and it's usually very good. They're usually mom and pop type places where you can get a stir fry, like pork and basil, or curry for between $1 and $1.50. Some elaborate dishes, especially seafood, might cost as much as $5. These eating spots are scattered through the city. I have small favorite haunts that I visit in most of the neighborhoods I've photographed in. One of the best gathering of street food stalls in the entire city is on Sukhumvit Soi 38, a longish walk from our apartment. 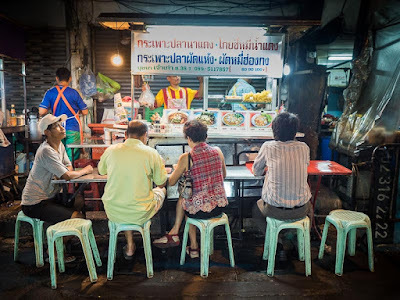 The food stalls on Soi 38 run the gamut from Chinese inspired noodle soups to curries to Thai stir fries to western favorites like hamburgers and Turkish kebabs. Diners on the sidewalk on Soi 38. A man who has had a Pad Thai stand on Soi 38 for 30 years cooks up an order of the Thai stir fried noodle dish. 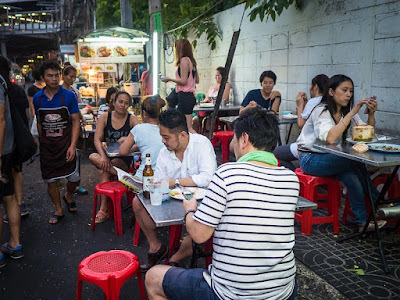 The Bangkok Metropolitan Administration announced this week that the street food stalls on Soi 38 have to close. The family who owns the land the carts are on haven't raised the rents in nearly 40 years. The family patriarch recently died and rather than keep the land in the family, and the food carts on the street, his heirs have decided to sell. It's prime land, very close to Sukhumvit Road and an easy walk to the Thong Lor BTS station. A condominium developer snapped up the property. The stalls that are in the street or on the sidewalk will be the first to go. They are expected to start closing as soon as next month. The stalls that are off the street may be around for the rest of 2015 but will be gone early in the new year. What's not clear is what happens to the stalls that have off street seating but on street kitchens. 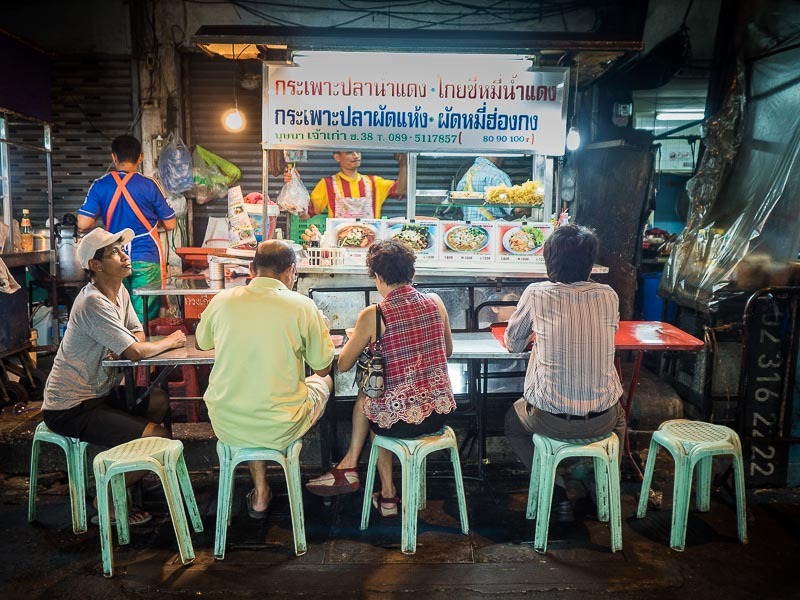 Some of the most popular stalls do their cooking on the street or sidewalk but provide off street seating for their patrons. Will they have to close next month when the other sidewalk places have to close or do they get a reprieve? A food cart that does all of its business in the street and on the sidewalk. Its time is limited. To be fair, this is not the end of the world. It's more like the passing of a beloved institution. 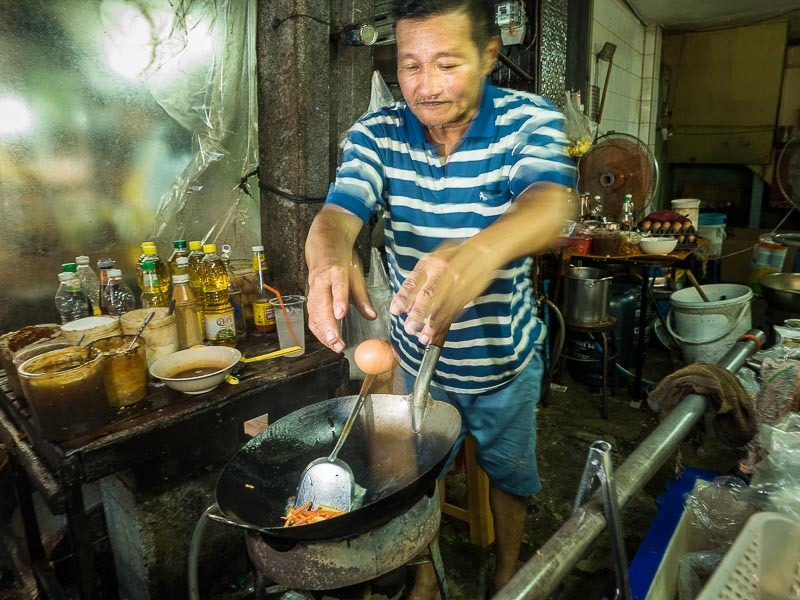 Street food is one of the things that makes Bangkok what it is. To quote Joni Mitchell, "they paved paradise and put up a parking lot." The development will bring in more jobs than the street carts provide, at least during the construction phase, but the practical question is "how much development can Sukhumvit sustain?" It's retail and condos from Soi 8 all the way to Soi 100. The small mom and pop shophouses have been torn down to make way to tall condos and expensive (and trendy) retail. Traffic is so bad on Sukhumvit that you can literally walk faster than the cars during rush hours. There are more photos of Bangkok street food in my archive.